Remember this guy? He was in the coop with an egg in his gullet when we got back from our trip to the Outer Banks. 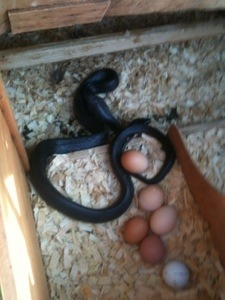 He came back; again he was coiled around the nest boxes in our coop, egg in gullet. This time, John found him. John carefully lifted him with those plastic, long-handled tongs you use to reach stuff that falls behind furniture, and placed Mr. Snake into a plastic container lined with wood shavings. (The very one that held my winter sock collection, thankfully John removed my socks before adding the snake and shavings.) You can see the bulge in his neck a few inches back from his head in the picture below. The snake was NOT happy about being held in captivity. He was hissing a little and his forked tongue darted in and out. He pushed against the top of the container in a bid to escape. He was not successful. He didn’t know it, but we didn’t plan to hold him captive for long. Despite Mr. Snake’s egg thieving tendencies, we do like him. I know some folks don’t care for snakes, but they offer a fair amount of pest control when they aren’t stealing eggs. We decided he would be happier living down by the river. 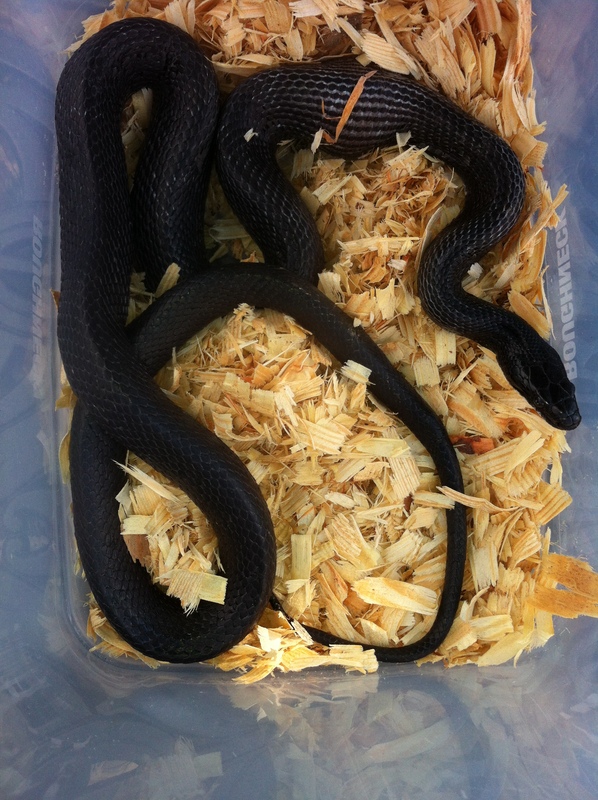 And the hens would be happier without a 4′ snake in their bedroom. It’s pretty by the river, the food supply is adequate and it’s FAR from the chicken coop. John and I had plans for the evening, so we got ready to go out and we thought we’d introduce Mr. Snake to his new river habitat on the way. We agreed that we were being kind; most farmers would decapitate a snake found in the coop. Before we could provide free relocation services, I had to put the hens away for the night. Chickens have no night vision, so are willing to go to their coop on their own right at dusk. As I have said before, nearly every creature on earth likes to eat chicken, so I use bribery to get the birds in when we are going to be away at natural bedtime. Each evening I prepare a platter of Greek yogurt topped with seedless grapes, with dried meal worms or chicken trail mix sprinkled on top. The hens would follow me to the ends of the earth for this treat so it’s very effective when I need to get them into the pen early. I put the treats in the pen, closed and latched the doors and left them to cluck and dine. Then I opened the lift top to the nest boxes to be sure they were clean and had adequate shavings for my Princesses to bed down after supper. When I did that I noticed a golf ball in one of the nest boxes. That’s normal. In fact, you can see one in the bottom right corner of the photo at the top of this story. When the birds were young, I read that you could put golf balls or any “fake egg” to help the youngsters know where to lay. I put one golf ball in each nest box. I just left them there, the hens seem to like pushing the golf balls around and they sit on them. Anyway, I noticed A golf ball. One. Not two. And three eggs. Not two. This could only mean one thing. Mr. Snake had ingested a golf ball, not an egg! P.S. Sweet Pea ate another little snake yesterday. She ducked into the brush and came out with a little black snake and swallowed him whole. What the heck? I feel like we are entering a chicken-snake-karma battle.